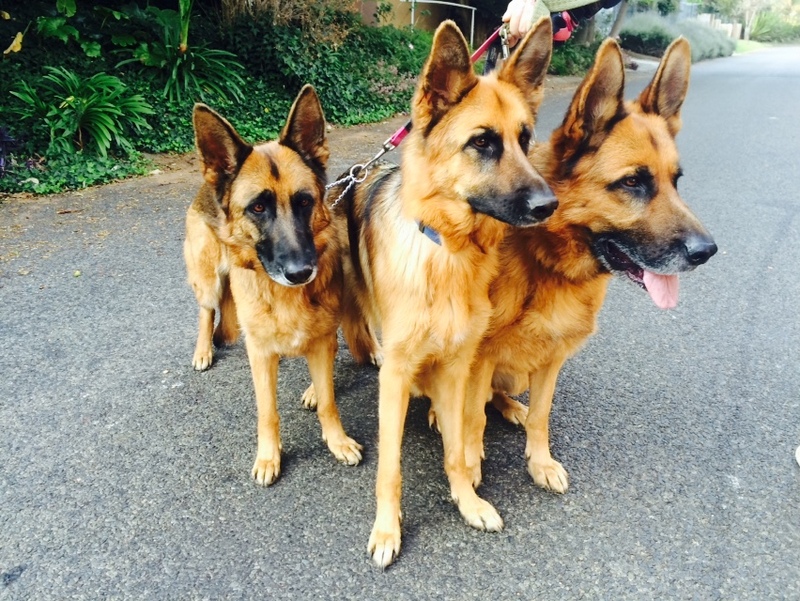 Dog Walker in Rivonia Johannesburg – Penny, Zorin and Tawnee are always happy to be going on their outing together. Joining them today was the two Schnauzers, Chloe and Bellamy. The sun was out nice and early, but we managed to stay in shady areas so the pups enjoyed a cool walk. The three are walking so well together, and are learning how to properly walk on lead and obey commands. Zorin is the excitable one of the bunch, always looking for new things to smell. Tawnee is curious too, and likes to make sure she can always see what’s going on around her. Penny is the reserved one, and she makes sure to simply concentrate on her walk. She is very calm, and doesn’t mind the presence of the other dogs. These three have come such a long way, and we are so proud to walk with them. At one point, most guide dogs for the blind were German Shepherds due to their loyalty, willingness, and intelligence however this has been overtaken by the Labrador and Golden Retriever, though German Shepherds are still used. They are also used a military dogs and have even been taught to parachute out of an aircraft! This breed has an excellent sense of smell and are frequently used in search and rescue missions as drug sniffer dogs and as bomb/landmine detection dogs. Wow, what a dog! This entry was posted in Dog Walking and tagged #YourHound_SA, animals, city streets, Dog walking, Early mornings, entertainment, exercise, facts, fit, fun, happy, Happy Dogs, healthy, Joburg streets, Johannesburg, Pets, Socializing, South Africa, Sunny Johannesburg. Bookmark the permalink.